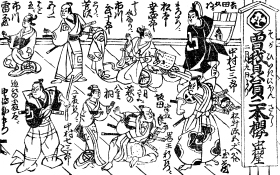 "Soga Biiki Nihon Zakura" mixed two sekai: it was a sogamono and a sumidagawamono. 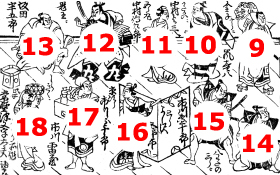 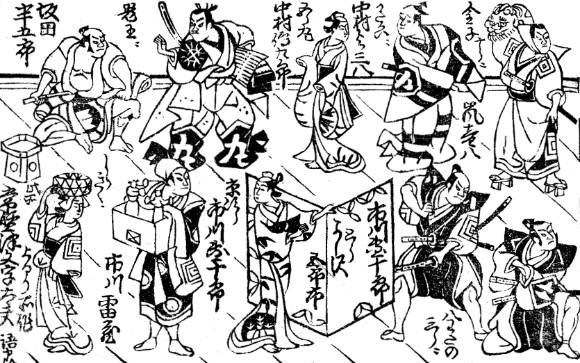 The Tokiwazu-based dance "Shinobu-gusa Chidori no Monpi" was staged at the end of the performance with Ichikawa Raizô I in the role of the shinobu-seller. 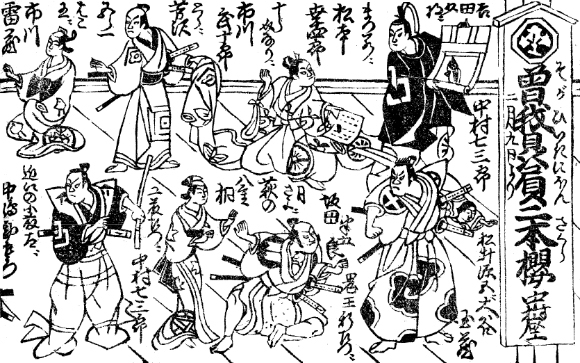 The actor Nakamura Nakazô I (not illustrated) played the roles of Kaba no Kaja Noriyori and Danzaburô (Gorô's retainer). 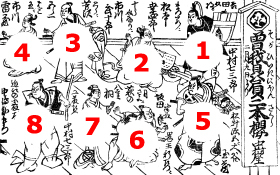 The actors Ichikawa Raizô I, Nakajima Kanzaemon II, Matsumoto Kôshirô III and Nakamura Shichisaburô II played the roles of Yukihira's sister Shiragiku, Nogamiya Kiheiji, Awazu no Shichirô, Matsukaze Sehei/Kume no Heinai and Kantô no Koroku. 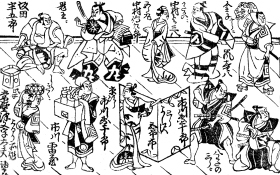 The opening day was the 9th day of the 2nd lunar month of the 12th year of the Hôreki era (1762), which was the 4th of March 1762 in the western calendar.